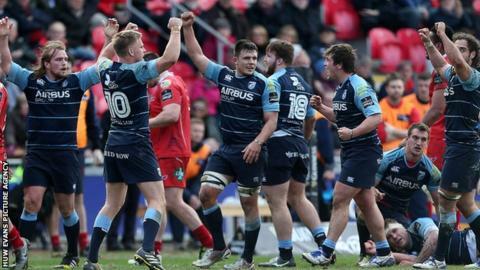 Cardiff Blues have not given up hope of a top six finish in the Pro12 after completing a double over Scarlets, says coach Danny Wilson. Their 28-22 win at Parc y Scarlets lifted the Blues to within four points of sixth place and a European spot. But it was a blow to Scarlets' hopes of clinching a home semi-final in the end of season play-offs. "It's still on the cards. We're within four points of sixth place," Wilson told BBC Radio Wales. "But our focus at the moment is the Welsh derbies, and we've got two more to come." Those games are against Newport Gwent Dragons at home on 17 April, followed by Ospreys at the Principality Stadium on at the Judgement Day double-header on 30 April. The Blues finish their season with a trip to Edinburgh on 7 May. Scarlets head coach Wayne Pivac said he was disappointed with his team's performance a week after beating Ospreys in Swansea. The New Zealander conceded the Blues high-energy game wrong-footed the Scarlets. "Sometimes you have to say your opponents have played well, and they did today," he said. "They brought a lot of energy and a lot of line speed defensively and because we weren't winning the collisions we weren't getting on the front foot and it made it very difficult for our backs. "We thought we could dominate them in the physical confrontations - they had gone for speed and it worked for them." Scarlets remain in third place but Pivac said he expects Glasgow to overtake them once they have played their game in hand. Blues impressed with the counter-attacking in the opening hour, but it was their gritty finish after Josh Turnbull's yellow card that caught Wilson's eye. "What I was really pleased with was in the latter stages with 14 men we showed good composure to see the game out tactically in the right way," he added. And we showed composure when the game wasn't at the speed we wanted it to be and the pace didn't suit us."